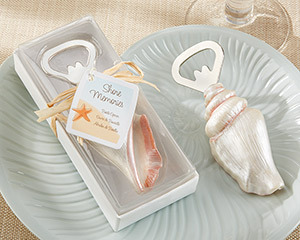 This "Shore Memories" sea shell bottle opener makes a unique favor for guests. The bottle opener is made of high quality stainless steel. The shell handle is hand painted resin and it is so intricately detailed in its design that it looks like a real sea shell. Each sea shell bottle opener is presented in an elegant gift box with a clear top and a raffia tie. A designer tag that reads "Thank you for sharing this day" is included on each favor. The opener measures 4" x 1.5" and the gift box measures 5" x 2".